I Have installed 'Publish Over SSH' plugin in Jenkins and would like to transfer few files to SSH Server after each Build . I have generated the private key using 'puttygen' with passphrase and have given the OpenSSH Public Key in 'authorization_keys' in SSH Server. Using the generated private key and passphrase , I'm able to login to the SSH Server through Putty . 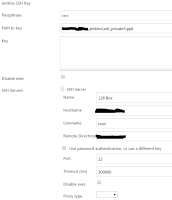 But in Jenkins I'm not able to add the SSH Key . Getting the below Error . If the JVM supports unlimited-strength encryption, we can enable more ciphers. And the new SSHD core version provides good API for it.